GV Health is pleased to announce a new mobile dental service, to ensure aged care residents in rural and remote communities have improved access to dental care. 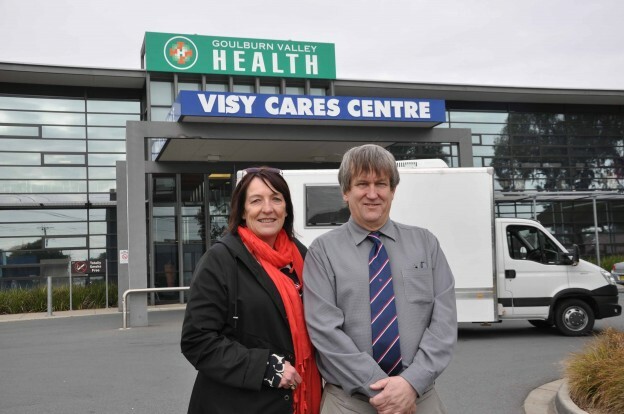 GV Health secured funding of $447,000 from the Federal Government to purchase a light weight IVECO van, complete with a dental chair, digital x-ray equipment, wheelchair access and an instrument steriliser. Dentists will be able to access electronic patient notes/treatment charts at the time of care via dental software in the van. Digital x-rays will be able to be viewed at the time of treatment. This van, which can be driven by any licensed driver, will visit aged care centres throughout the region, as well as remote areas, kindergartens, youth and infant welfare centres and centres for the intellectually disabled for familiarisation, treatment and oral health promotion. Previously, dental staff had portable equipment they would take in a car to community facilities to provide dental treatment; only a limited range of services were available with the makeshift facilities. Dr David Whelan, GV Health Clinical Director Dental Services, said the mobile dental van will reduce barriers to access, such as cost and transport, and will increase the levels of preventative and early intervention treatments provided to vulnerable groups. “By providing these vital dental services now, it will help reduce the need for emergency dental treatments over time. “The mobile dental van will improve access to a broader range of dental services for disadvantaged individuals and groups who find it difficult to travel for treatment. “Access to care will be improved for those with higher levels of oral disease and will enable treatment, in a familiar setting, for clients who cannot easily be moved,” said Dr Whelan. Jayne French, Manager, GV Health Tatura Parkvilla Aged Care, and Acting Waranga Nursing Home and Waranga Aged Care Hostel, said this will be a fantastic service for residents of aged care facilities throughout the region. “Regular dental health check-ups are important for maintaining good oral health. This mobile dental clinic is an innovative service that will provide our region’s most vulnerable people and those who have restricted mobility with vital preventative and restorative dental care,” said Ms French.